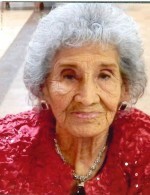 Soledad Betancourt Rivera (Chole) died at Memorial Medical Center on January 28, 2018 in Las Cruces, New Mexico at the age of 95. She is survived by daughter Esperanza Montoya (Felix) of Tucson, Arizona, daughter Genevieve Martinez of California. Surviving grandchildren Minerva Ostos (Ernie), Felix Montoya Jr. (Rachael), Monica Renee Tovar (Joe). Her great grandchildren, Ernest Ostos, Joshua Pacheco, Denissa Pacheco (Michael Banegas), Steven McElderry (James), Felix Montoya III, Robert Montoya, Vicente Montoya, and Nataniel Tovar. Great-great grandchildren Jaiden Ebling, Levi Ebling, Anthony Montoya, Veronica Jicama, Teresa Medina, Victor Martinez, Trisha Martinez and Vanessa Lopez. Soledad is also survived by Isabel Huerta and wife, Jenny Polanco and husband, and Mary Romero. Soledad is survived by her sisters-in-law Dolores (Lola) Rivera, Dolores Wood and brother in law Edward “Lalo” Rivera..
She is preceded in death by husband Rodolfo Rivera, her parents Domingo Betancourt and Juanita Vasquez Betancourt, mother in law Gomicinda Rivera, brothers Telesforo, Pedro (Fidencia) Nieves and Martin. Sisters Angelita (infant), Manuela Betancourt and Josefa B. Duran (Alfredo), her brother in law Robert (Bobby) Rivera, Frank Rivera (Kiko) and wife Estella, niece Juanita Trujillo (Eleazar), Rosa Trujillo (Leo), and grandson Leo M. Pacheco. Soledad worked as a cook for many years in Bayard, NM and after her mother passed away she moved to Las Cruces, where she worked for Elvis and Sylvia Vaughan as their housekeeper and nanny. Soledad met Rodolfo and they were married in the late 50’s. She enjoyed crocheting, making tamales and tortillas, baking cookies and banana bread. She enjoyed drinking a cold beer and even a whiskey shot every now and then. She was a devout catholic who prayed the rosary daily. She always gave donations to her church Santa Rosa de Lima and would send money to the Missionary Oblates of Mary Immaculate in Belleville, IL. She graciously accepted Holy Communion at home. She loved everyone, and she loved her nieces and nephews as if they were her own children. The friends she had were more like family to her especially Gloria Flores, Margarita Apodaca Socorro Perez, and Pascuala Jimenez. She had a beautiful sense of humor and her faith in god kept her going strong. She never complained about pain. Her sudden death has left us with a big void in our hearts. Blessed are those who knew and loved her. She will be missed. A rosary for Soledad Rivera will be held at Getz Funeral Home on February 6th, 2018 at 7:00pm. A Public visitation will be held before the rosary from 5:00pm to 7:00pm. The funeral Mass will be held on the following day February 7th, 2018 at 10:00am, at St. Genevieve’s Catholic Church, located at 100 S Espina St, Las Cruces, NM 88001. Burial will take place at St. Joseph’s Cemetery following the funeral mass. Pall Bearer will be Felix Montoya III, Roberto Montoya, Vicente Montoya, Steven Tirre, Ernest Ostos Felix Montoya Jr. Honarary pallbearers Ernie Ostos. Arrangements are with Getz Funeral Home 1410 E. Bowman Ave., Las Cruces NM 88001. Please visit www.GetzCares.comto sign the local online guest book. To send flowers to the family of Soledad B. Rivera, please visit our Heartfelt Sympathies Store.